Thick enough to eat with a spoon, smoothie bowls can be enjoyed as a refreshing, healthy meal – or even a delicious dessert. In her book, 200 Best Smoothie Bowl Recipes, Alison Lewis offers up unique and beautifully photographed recipes, perfect for adding more fresh fruit and superfoods to your diet. This breakfast smoothie has it all: protein, carbohydrates, fiber, antioxidants, vitamins and minerals. Tip: Shredded coconut is full of flavor and makes a healthy snack. Use it to decorate cakes and pies, or add it to granola or trail mix. In blender, combine yogurt, flax seeds, banana and peaches. Secure lid and blend (from low to high if using a variable-speed blender) until smooth. Add ice, one cube at a time, blending until the desired consistency is achieved. 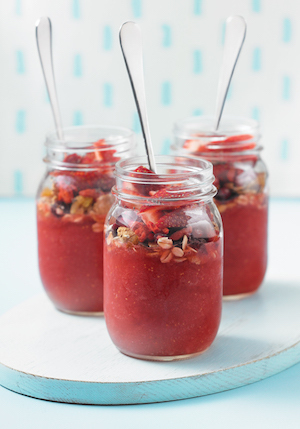 Pour into bowls and top with any of the suggested toppings, as desired. Kale is high in vitamins K, A and C, iron, calcium and fibre. I made this recipe for some of my kids’ friends, and they loved it. 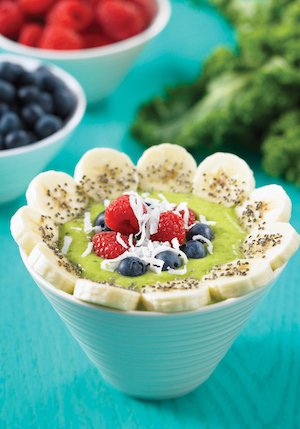 Their moms couldn’t believe they were eating a green smoothie bowl with kale. Tip: Use leftover coconut milk in soup recipes, Thai recipes, hot chocolate and breakfast cereal. 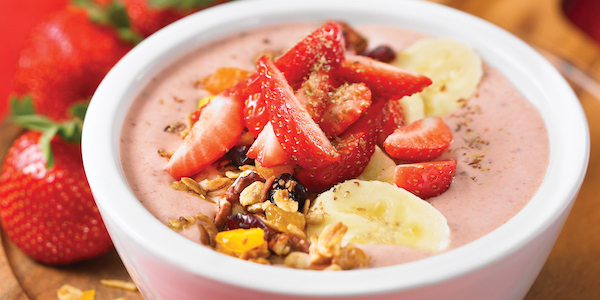 If you prefer, you can use store-bought granola to top your smoothie bowl. In blender, combine coconut milk, banana, mango, kale and coconut. Secure lid and blend (from low to high if using a variable-speed blender) until smooth. If a thicker consistency is desired, add ice, one cube at a time, and blend until smooth. Pour into a bowl and top with any of the suggested toppings, as desired. 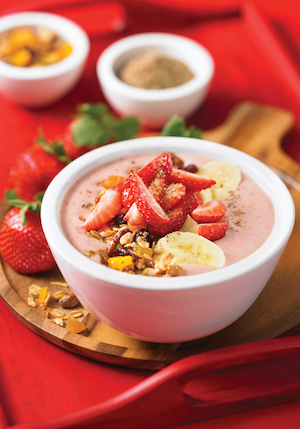 Pomegranate juice, tea and strawberries all contain antioxidants, so this smoothie bowl is healthy as well as delicious! Tip: If you can’t find pomegranate-flavored tea, you can substitute any berry-flavored tea. In blender, combine tea, pomegranate juice, honey and strawberries. Secure lid and blend (from low to high if using a variable-speed blender) until smooth. If a thicker consistency is desired, add ice, one cube at a time, and blend until smooth. Pour into a bowl or bowls and top with any of the suggested toppings, as desired. Alison Lewis is a renowned recipe developer, food and travel journalist and photographer. She is also the author of 150 Best Grilled Cheese Sandwiches and 400 Best Sandwich Recipes. Alison resides in Birmingham, Alabama. 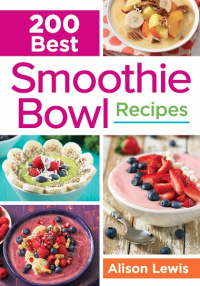 Recipes courtesy of 200 Best Smoothie Bowl Recipes by Alison Lewis (2016) www.robertrose.ca. Reprinted with publisher permission.